How have I gone 29-years in Wisconsin without going to the Mars Cheese Castle? Somehow, I’ve never been presented with the opportunity. Maybe my parents hate cheese (false), maybe it’s just inconvenient to get to (true), maybe I’m not supposed to consume dairy (true). Well my friend, it happened. TJ and I finally went to Mars Cheese Castle. TJ, of course, has been there before as he’s a great cheese-lover and loyal Wisconsin resident. While researching places to meet friends “in the middle” between us and Chicago, MCC as thrown out there. “I’m up for it if you are…” was the response. And so it was. Mix: First of all, I had no idea there was a tavern at The Castle. Second, it was busy! The bartender was very good at multitasking. While she was pouring beers, she was making our Bloody Marys from scratch right in front of us. First, she squeezed a lemon wedge in and rimmed the glass for the celery salt dip. Next, horseradish, Worcestershire, a mystery liquid (maybe lemon juice?) and tabasco with an 8 ounce can of V8. Next vodka and ice. Watching her make it, I felt like it was going to be super simple. I was wrong! It was so flavorful! It was a really good consistency, and the vodka flavonoids were poking through just a touch. It was very classic, a bit spicy … and good! Garnish: The garnish here was super simple and let the mix tell the story. A spicy pickled asparagus and two green olives. And that, my friends, was all she wrote. For 2 minutes. Almost immediately after the bartender served us our Bloody Marys, she gave us an entire platter of cheese and crackers. TJ was in heaven. We’re still confused on why we were the chosen ones but shared with the other patrons in The Castles tavern. The little treats were a well-pared companion to the Bloody Mary. Chaser: Yes, this came with a chaser. The bartender asked what we’d prefer but TJ and I both let her pick. Friends, you should trust your bartenders! She gave us both a chaser of Point. 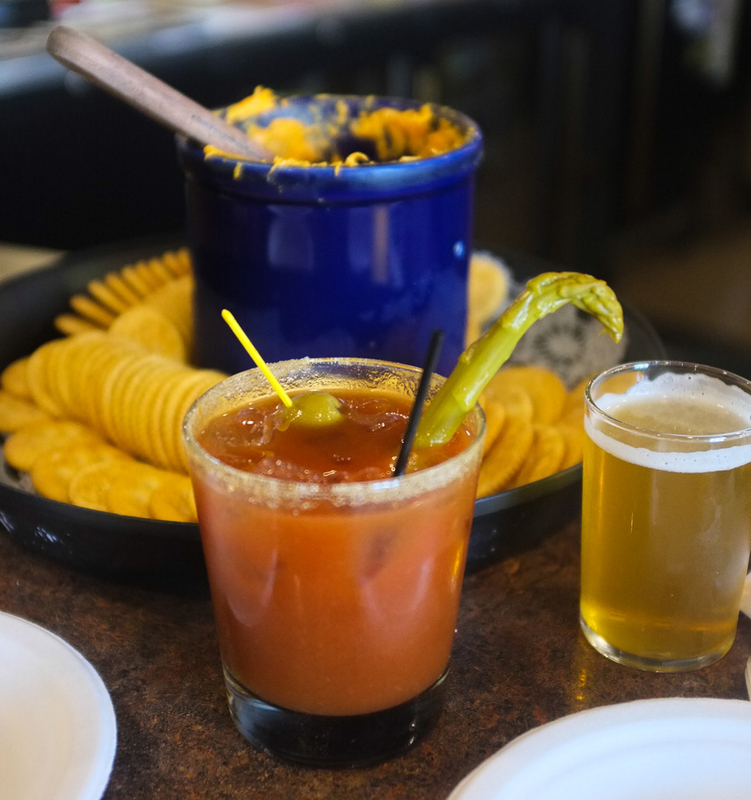 Size: Mars Cheese Castle serves their Bloody Marys in a 12-ounce glass. TJ and I both agreed that it was the perfect size. It wasn’t too filling and it satisfied my craving. Buzz: Guilty! We went to the Kenosha outlets afterward and spend a little too much money at the j.crew outlet. It was an awesome experience! Cost: You’re not going to believe this. The cost was FIVE DOLLARS. FIve. You can count that on one hand, friends. Totally worth every penny! I think it goes without saying I enjoyed my first trip to Mars Cheese Castle. It was one of my favorite Bloody Marys in a while! I highly recommend taking a trip some weekend afternoon to check it out. This entry was posted on August 9, 2014 by Shannon in Bloody Marys in the area and tagged Bloody Mary, bloody with cheese, Kenosha, Mars Cheese Castle, Mars Cheese Factory, Wisconsin.